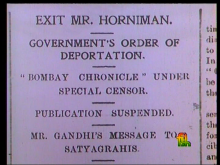 A film indicating the role played by the press in India’s freedom struggle. James Agustus Hicky started the Bengal Gazette in1780 followed by many others who saw the potential the press held in the struggle for independance. Raja Rammohan Roy started the Bengali weekly ‘Sambad Kaumudi’ that was instrumental in pushing for social reforms..